McCormick, the spices and herbs company came up with a novel plan – across some stores in the United States, they launched several fun activities – they invited shoppers to “guess that spice” after smelling it. Shoppers could find their unique flavor profiles. They could see how spices are made or watch a cookery show or play a fun game. More than 70% of customers who came into the store tried at least one of these – and McCormick was left with a gold mine of data, for them to understand what the next generation of customers want from the company. Retailers are doing all they can to get their customers’ attention. Get them to engage with their brand. Some of them use digital signs – you can do a lot with these! For instance, if a prospective customer stands in front of it, you can show a targeted ad based on their gender and age range! There are signs that even engage the senses of smell and sound like the one Costa Coffee had! Digital signs can be put in store aisles showing videos about any specials or new products, or promote a brand or a price right at the point where buying decisions are being made. For instance a dairy store increased sales by running promos and offers of nearly-expired products and by showcasing new launches. This kind of thing brings the ease of online retail into a brick and mortar store where the customer has access to all kinds of information on one side, and the retailer gets data – data about what works with his customers, which he can use to manage inventory and make product forecasts. Some retailers have a huge range of products that are just impossible to display on the shop floor and so some of them have large interactive visual displays. Products are brought to life with huge images on these interactive high-definition displays – and it allows customers to even look inside large appliances like refrigerators, so they can make informed choices. The shoe company Adidas had an interactive video wall in their stores which increased sales by as much as 40%! Through these video walls customers could see images of the shoes, understand their features, pick colors and sizes, check availability and then buy! If a retailer chooses to go mobile, he can take things to a different level. Customers can be sent deals and offers on their mobile phones which can be redeemed at the POS terminal. The retailer on the other hand, gets valuable data – data about what a customer really wants and can send relevant offers. Retailers can then create an informative and productive shopping experience for their customers attracting them to their physical stores and company web sites. According to some tests conducted by Intel at 10 different retailers, context-aware ads increased monthly sales by an average of 16% across 15 diverse product types. And customers can shop more efficiently. At the end of the day, it is all about keeping a customer happy. A recent survey by Accenture showed that U.S. consumers definitely want a more personalized retail experience. 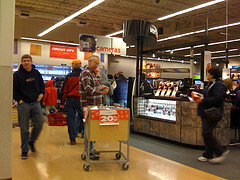 But they are divided on the kind of information they are comfortable disclosing as well as the kind of tactics retailers use. The study found that while 60 percent of consumers want real-time promotions and offers, only 20% would like to disclose their location and just 14% their browsing history. And as much as 90% said that if they could, they would limit access retailers had to certain types of personal data. Customers were most happy with automatic discounts at checkout for loyalty points or coupons (82%) and real-time promotions (57%). They found that customers are willing to give information to retailers but that they wanted something in return – like access to exclusive deals (64%), coupons and loyalty points (64%), discounts and special offers (61%). The survey found that at least 48% are okay with getting online reminders from mass retailers, drug stores and grocery stores to order items that they might need re-filling. 51% like the idea of “one-click” checkouts. On the other hand, as much as 48% do not like the idea of in-store purchases being charged automatically to their accounts. Very few people are willing to share either their credit scores or medical information or social media contacts. Some of them say they would be happy if a drug store would tell them not to buy a certain medicine online if it would react negatively with any other medication that they were taking. But some say that it is too much. Customers like retailers sending them relevant offers, but retailers trying to make sure a customer buys a certain product based on their demographics, was a bit much! Retailers telling their customers not to spend beyond their budgets or buy stuff outside their dietary restrictions was way too much. At the end of the day, data can be a powerful tool in the hands of the right people helping retailers to differentiate from their competitors, increase basket size and build customer loyalty. But it is a question of knowing what works and what doesn’t. What is great strategy and what is, just simply too much. It all depends on how well you know your customers – which will help a retailer know what can drive the best business results.